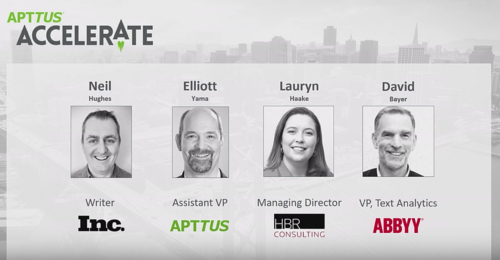 The Apttus Accelerate event is described as “The Intelligent Quote-to-Cash event of the year”. Accelerate brings together leaders, achievers, and innovators in across multiple industries. Attendees share best practices and innovations from sales, IT, operations, marketing, legal, finance, and executive roles. I was fortunate to attend this year’s event at Pier 48 in San Francisco. I enjoyed interviewing tech leaders from Thomson Reuters, IBM Watson, Apttus CEO Kirk Krappe and was also asked to take part in a tech panel. The theme of the talk was entitled “The Rise of the Machines: Surviving (and Thriving) in a Legal Tech World” and it was a great honor to be sat alongside Lauryn Haake, Elliott Yama and David Bayer. Professionals in law, contract management, and legal administration have been working with information technology for years. More recently, machine learning and artificial intelligence have started to disrupt how these workers do their jobs. The panel discussion was aimed at law professionals and helping them see the opportunities rather than the challenges that this technology is bringing to businesses. Understanding what these new technologies can offer, how they’re starting to be used, and how the audience can take control of this accelerating trend was the main purpose of the panel discussion. For anyone that was unable to attend and interested in the subject matter, I have posted the video below. Our personal lifestyles now include the ability to hail a cab, book a restaurant table and even book a hotel room within a few swipes on our smartphones. It seems that business are finally waking up the fact that these expectation levels are now being taken into the corporate world. The success and rapid growth of Apttus could be attributed to the company leading the way in removing the expectation level barrier that exists between our homes and offices. By eliminating the cumbersome processes, enterprises will find an easier way to do business and dramatically increase their profits.